Since his father’s mysterious disappearance, Chase Tinker has been getting into a lot of trouble. Chase is also dealing with the fact that he can manipulate objects with his mind, and now his younger brother, Andy, is able to freeze time. The boys are in for the surprise of their lives when the grandfather they didn’t know they had appears on their doorstep and announces that they are part of a magical family. The Tinkers also have an old foe that has been trying to steal the source of their magic and is very likely responsible for whatever happened to Chase and Andy’s dad. Together with their newfound family members, the brothers are ready to face their enemy and find their father. When it comes to reading, I think a part of me will always be a kid at heart. That’s why I still enjoy reading middle grade books from time to time; they take me back to some of my happiest childhood memories. 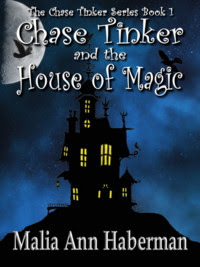 Chase Tinker and the House of Magic contains all of the elements that made me fall in love with reading all those years ago: a relatable hero, a thrilling story, and lots of magic! The standout aspect of this novel is the writing. The characters, the setting, and the pacing are all very well done. I especially loved the descriptions of the Tinker family’s magical house; they burst with such vibrant imagination. What I wouldn’t give to explore a place like this and try out the different magical powers that each room holds! Want to time travel? Not a problem—there’s a room for that. Need to teleport? There’s a room for that, too. If the book had only been about exploring every nook and cranny of the house room by room, that would have been enough to keep me reading. I thought Chase made a great main character—brave and daring, yet sometimes too rash with his decisions. I loved how he and Andy looked out for each other, and their good-natured sibling squabbling lent a sense of realism to their relationship. I also liked how they formed a tight-knit quartet with their cousin, Janie, and Persephone, the housekeeper’s daughter. Chase’s crush on Persephone and how embarrassed he became around her were just too cute. The twist toward the end of the novel quite surprised me and should lead to some intriguing plot developments in the next book. It’s been a while since I’ve read a magic-themed book for younger readers, and they, too, should find this both engaging and enchanting. There’s plenty of action and mystery, and let’s not forget the magical house that is just built out of plain awesomeness. This is a fun read for younger readers and not-quite-so-young readers alike, and it’s yet another middle grade novel that I wish had been around when I was growing up. I'd seen this one around so I was super excited to see that you'd read and reviewed it! After reading your review, I instantly added it to my reading shelf! Like you, I will forever be a kid at heart when it comes to reading and Chase Tinker sounds like something I could see myself completely loving just as you did! I loved your description of the magical house (which sounds A-mazing by the way) and the characters & plot seem brilliant too :D Thanks for the great review Lee!! This is such a charming book, and I really liked how it had its own spin on magic. And the house- I can only dream of living in a magical house like that! I'm planning on review this one soon. Now I want to read it more than I did before! Great review! I hadn't read a middle grade book in a while before reading this, so I was more than overdue. I'm glad to hear that you enjoy reading them, too! Aww I miss reading middle grade books! I was a sucker for Goosebumps books by R.L. Stine, and the Katie Kazoo Switcheroo books lol. This sounds like a cute and fun read (-: I'm not really in the mood for middle grade books, but I'll check it out sometime and will read it with my younger brother. I think it'd be an awesome read for you guys! I remember when Goosebumps first came out, and my best friend bought a giant stack of them for her younger sister, who was obsessed with that series.